There are a lot of fine-dining restaurants in Boston that still don’t make much of an effort with the non-alcoholic drinks, and that bums me out. Especially when you’re dealing with tasting menus, a fair portion of the population doesn’t want to drink wine for whatever reason, but they don’t want to feel like they’re “missing out” on a substantial portion of the dining experience either. Anytime I talk about non-alcoholic drink pairings, I have to begin with L’Espalier, a Boston staple for traditional French dining — not just because it was my first experience with non-alcoholic pairings, but because it set such a high bar for all such future experiences. I remember vividly a tasting menu paired with a refreshing pineapple-cucumber-mint combination, sweet spice-mulled cider, and a banana-cinnamon concoction with dessert. On one of my return visits to L’Espalier’s slightly-more-casual “salon,” I discovered the lychee lemonade. This drink starts with a breezy lemonade, lightly carbonated — remember, une limonade in France will be carbonated, whereas traditional American non-carbonated lemonade is un citron pressé — and then adds the floral, un-replicable flavor of the lychee, an Asian stone fruit. I celebrated my graduation at Del Frisco’s, a longtime standby for celebratory dinners. With some of the best steaks in the city, lobster tails like sea monsters, a take-no-prisoners cheesecake that I can finish all by my lonesome; and by all accounts, a killer wine selection, it’s a complete experience. But instead of asking about the wine, I asked the bartender to make me a non-alcoholic cocktail. The resulting combination of whole blackberries, muddled mint, lemon juice, and spicy ginger beer knocked my socks off. Technically, this drink is on the regular cocktail menu at Del Frisco’s, and they made a non-alcoholic version upon request, but it stood out enough that I have to include it on this list one way or another. You should request it too. One of the acclaimed jewels of Barbara Lynch’s culinary empire, Menton (like L’Espalier) features an entire menu of non-alcoholic drink pairings for the restaurant’s extensive French tasting menu. 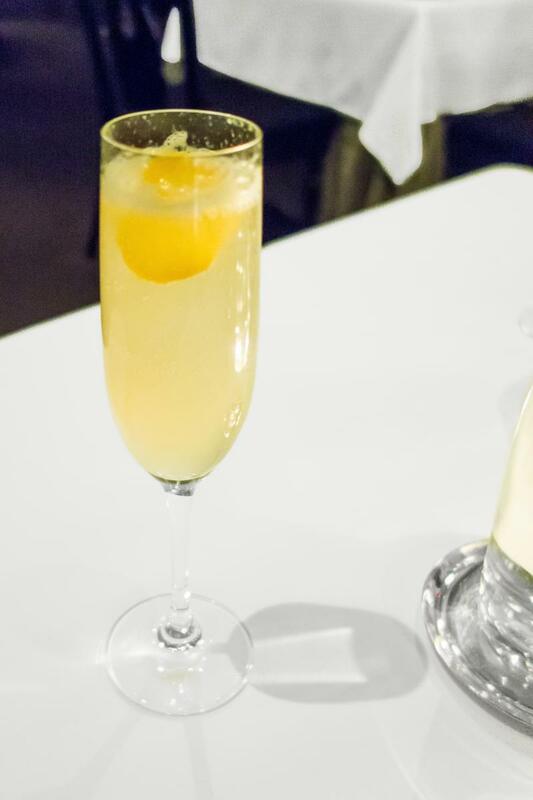 The elderflower and grapefruit fizz, a standout among Menton's many impressive drink pairings, is the perfect kickoff to a fancy meal: all the elegance of champagne, sans alcohol. I drink it with my pinky sticking out because I’m fancy like that, but if you aren’t quite as much of a dork as me, I’m sure it tastes just as delectable if you hold the drink like a normal human being. The affable sibling trio behind the Mei Mei food truck expanded to a brick-and-mortar restaurant before heading to the obvious third step, a shipping container. I signed the petition in support of Mei Mei getting a liquor license for their brick-and-mortar, but secretly, I always thought they didn’t need it as long as they kept the Haymaker’s Punch on the menu. This drink is wonderfully weird: apple cider vinegar, honey, and bitters. So the eponymous “punch” doesn’t refer to a fruit juice combo, but rather, the pucker-inducing vinegar and bitters that will hit in the back of your throat a half-second after you take a sip. Don’t worry, there's just enough sweetness from the honey to keep you coming back for another vinegary indulgence. Nicole Fleming is the author of The Girl Who Ate Boston food blog, where she has written about all four of the restaurants listed here over the years: L’Espalier, Menton, Del Frisco’s, and Mei Mei. Follow her on Twitter @GirlEatsBoston.